Keum boo, the art of bonding pure gold foil to a silver surface, is a fascinating technique on so many levels – historically, scientifically, and artistically. In his online workshop Keum Boo Techniques, metalsmith Joe Korth provides a wealth of information and a detailed step-by-step demonstration of how to make keum boo jewelry shimmering with 24-karat gold. ABOVE: Keum boo jewelry techniques allow you to add delicate gold foil to your pieces without investing a fortune. 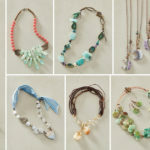 Don’t miss Joe Korth’s online keum boo jewelry workshop based on his popular video! HISTORICALLY, the precise origins of keum boo are unknown, making the technique mysteriously enticing. We do know that for thousands of years in East Asia, eating pure gold was believed to provide health benefits. While the very wealthy could afford to eat with solid gold utensils, those with less means began decorating their spoons and chopsticks with gold overlays. These overlay designs eventually expanded into sculpture and jewelry. Heat (in the form of a hot plate) and pressure (in the form of a burnisher) is all it takes to adhere the gold foil to the silver. This process is called diffusion bonding. SCIENTIFICALLY, there’s a lot going on with keum boo! Joe explains that unlike with fusing, in which the metals reach their melting points, what’s happening during keum boo is diffusion bonding. This happens at a much lower temperature, about 700 degrees Fahrenheit. When heat and pressure are applied to the gold and silver, atoms are exchanged to create a permanent bond. To create a striking contrast between the two metals, you can darken the silver with liver of sulfur. ARTISTICALLY, keum boo opens up rich possibilities with color and pattern, and the best part is that you can add a hint of gold to your work without breaking your budget. You’ll love Joe’s pointers for planning your design, from developing an eye for pattern to experimenting with positive and negative space. If you have a rolling mill, you may want to take advantage of it to roll your own keum boo foil from an ingot. 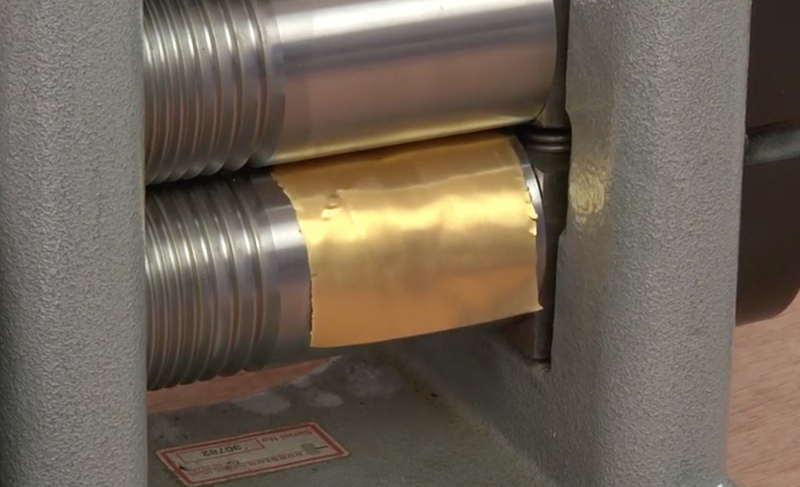 Joe teaches how to roll your own gold foil with a rolling mill, though you could purchase commercial keum boo foil if you like. You’ll also learn how to make a brass template for an earring base, and how to prepare sterling silver for keum boo with depletion gilding. Joe demonstrates the process of depletion gilding to create a pure silver surface on the top layer of sterling. I used to be convinced that depletion gilding was too complicated for me to understand, but Joe made it seem easy. Heating and pickling the sterling silver repeatedly (about six times) removes the copper from the surface, leaving you with a pure silver layer to which to adhere your gold foil. Alternatively, you could start with fine silver if you want to skip the depletion gilding. The magic of keum boo: cutting the foil, tracing the earring form, arranging the gold foil, and burnishing over a hot plate. 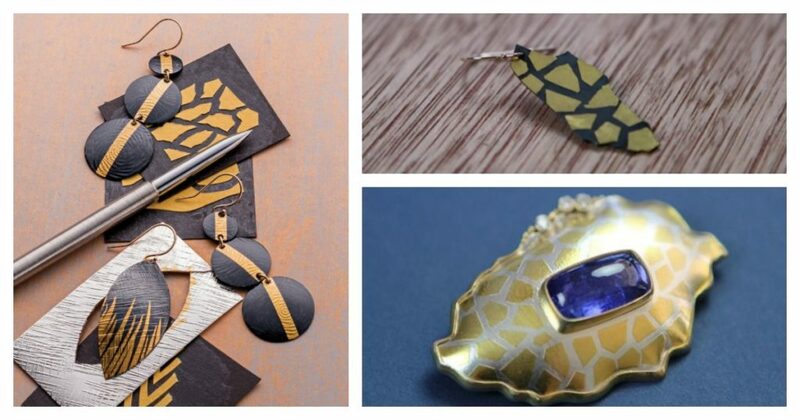 The actual process of attaching the gold foil is surprisingly simple, requiring just a hot plate (affiliate link), your metals, and some simple tools. 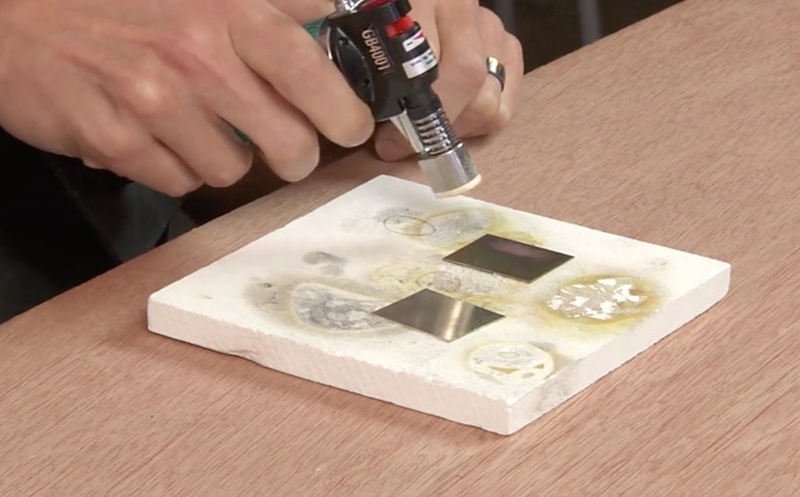 Joe gives excellent tips on cutting the foil, arranging your design, and burnishing the gold over the heat source. And if you were expecting inspirational ways to texture, patinate, and finish your designs, you’re in luck! Did you expect any less? 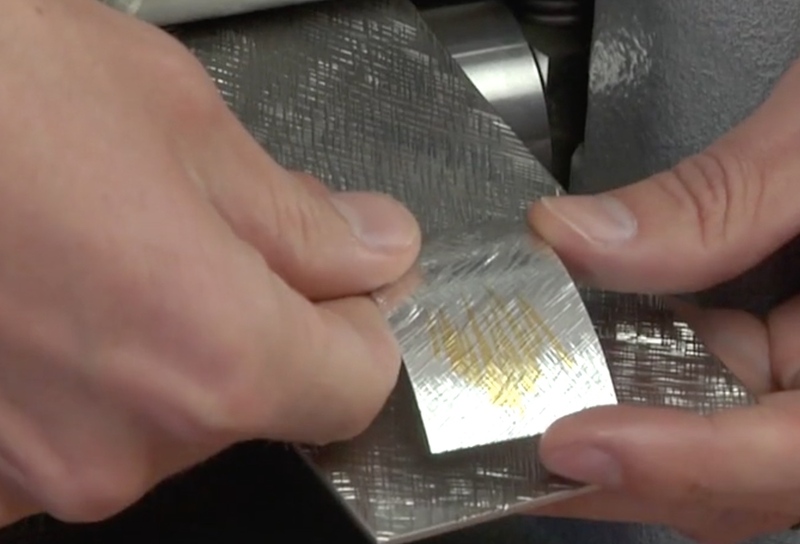 In this variation, Joe adhered the gold foil first, then roller printed the metal to give it texture. At this point, he’s ready to cut out his shape with a jeweler’s saw. Joe’s experience with keum boo makes this workshop a pleasure to watch. Keep his advice in mind as you try your hand at this intriguing technique. Keep your eyes open for pleasing patterns and uses of positive and negative space. Peruse books (affiliate link), observe nature, and snap photos of inspiring designs you see. Since gold is expensive, it’s a good idea to first make a prototype of your design with gold-colored paper and black card stock. Not only will you be able to judge the look, but you’ll also get an idea of how difficult your design is to cut out. For best results, place a sheet of tracing paper over your gold foil before cutting it with an X-Acto knife (affiliate link) or another sharp tool. Fine silver is ready to accept gold foil as-is. For sterling silver, you’ll need to complete one extra step called depletion gilding. By heating and pickling the sterling about six times, you will successfully remove the copper from the surface of your metal. It will then be ready for the keum boo. When working on the hot plate, you’ll want a pair of long tweezers and a burnisher. Hold your piece in place with long tweezers while you use a burnisher in the other hand to adhere the gold foil. Check out the Interweave store for these keum boo project downloads! From left: Keum Boo Panel Bracelet, Keum Boo Earrings, Kyanite and Keum Boo Pendant. Don’t miss Joe’s workshop Keum Boo Techniques! 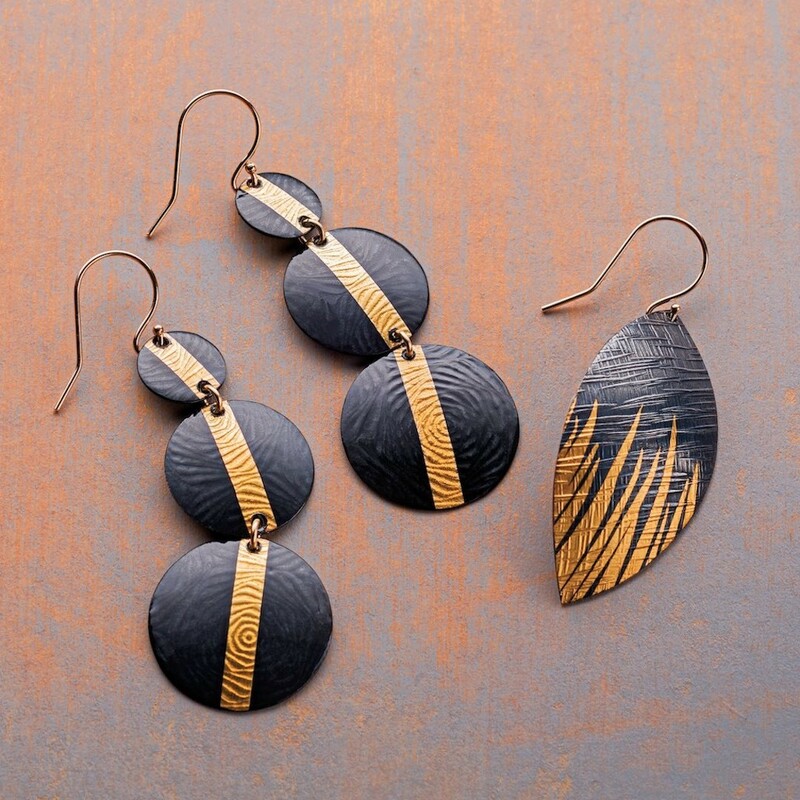 Purchase it individually or subscribe to Interweave’s Online Workshops to access our growing library of courses covering all kinds of great jewelry techniques. Crazy for Keum Boo? Check out these resources!